Arianespace hopes to have seven government, or "institutional" orders for Ariane 6 before contracting for the production of 14 such rockets from ArianeGroup. So far it only has three. Illustration shows the Ariane 62, version (two side-boosters) that is optimized for institutional missions. Credit: Arianespace. 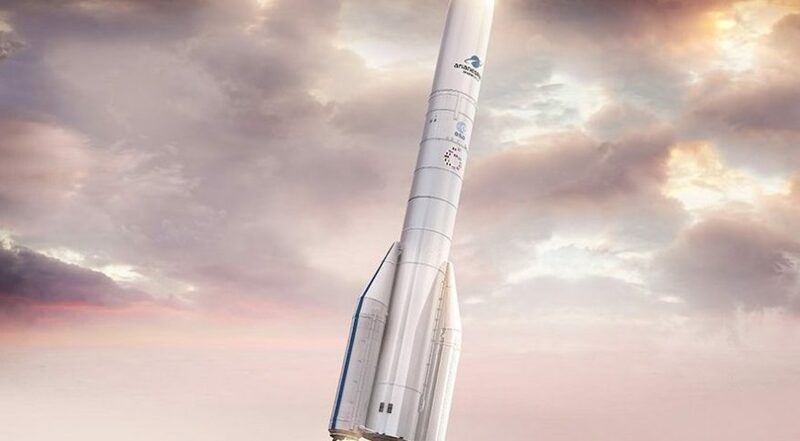 WASHINGTON — European launch provider Arianespace says that in order to sign a manufacturing contract for the first 14 next-generation Ariane 6 rockets, it first needs European governmental organizations to buy at least four more Ariane 6 missions for the 2020 to 2023 time frame. Arianespace hopes to have seven government, or “institutional” orders for Ariane 6 before contracting for the production of 14 such rockets from ArianeGroup. So far it only has three. Illustration shows the Ariane 62, version (two side-boosters) that is optimized for institutional missions. Credit: Arianespace. Israël said Arianespace committed to making the Ariane 6 more competitive “in exchange for commitment from the public sector regarding institutional launchers,” and that the entire plan for Ariane 6 is predicated on this so-far absent commitment. Daniel Neuenschwander, the European Space Agency’s director of space transportation, spoke similarly of an urgency to begin launcher production so that the Ariane 6, as well as the smaller Vega C, can replace Europe’s current launcher family (the heavy-lift Ariane 5, medium-lift Soyuz and light-lift Vega) over a transition period from 2020 to 2023. He pushed back, however, on the notion that a game of brinkmanship between European government institutions and Europe’s launch industry might leave Ariane 6 factories idle. “I doubt that any stop or impact on the production is in the interest of anybody,” he said. Neuenschwander said stabilizing the transition to Ariane 6 and Vega C is ESA’s top launcher objective heading into this year’s ministerial conference in Seville, Spain, in November. The ministerial is where ESA seeks funding from its 22 member states for various space programs. Neuenschwander said ESA is working on switching the Jupiter Icy Moons Explorer, or JUICE, satellite from an Ariane 5, which is the current plan, to the Ariane 6, in order to add a fourth institutional mission to Arianespace’s backlog for Ariane 6. Neuenschwander said he could only speak for ESA, not other European institutions on buying Ariane 6. Israël said the reason European institutions have not bundled their orders for Ariane 6 appears to be due to the absence of a centralized procurement agency for European space. In October, ministers from France, Germany, Spain, Italy and Switzerland signed a joint statement acknowledging the importance of consolidating their government space missions so that Europe retains its ability to launch satellites into space without relying on outside nations. The ministers stopped short of a firm contract, however. Israël said Arianespace has recognized the “ambition,” albeit disparate, coming from European institutions, but stressed a need for those ambitions to be made concrete. Arianespace is relying on that government demand to ensure a stable production rate for the Ariane 6 — an important factor in ensuring the launcher meets its cost target of 40 to 50 percent below today’s Ariane 5. 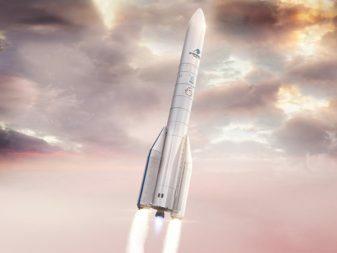 The European Space Agency, ESA, tasked ArianeGroup with designing and building Ariane 6. Of the 14 rockets Arianespace plans to buy, it expects to fill half with commercial customers. Paris-based Eutelsat is the first such customer, having assigned five satellites to Ariane 6 missions. Like with the Ariane 5, Arianespace intends to launch commercial telecom satellites two at a time on Ariane 6. Institutional missions, such as science and weather spacecraft, are intended to use a lighter version of the rocket equipped with two strap-on boosters instead of four. Israël said Eutelsat has some flexibility between the Ariane 6 and Ariane 5 in its multi-launch contract, but that the Ariane 6 is the baseline. He said Arianespace anticipates four of the Eutelsat satellites will launch on Ariane 6s, and one on an Ariane 5. Israël said Arianespace is in “active discussions” with customers interested in flying on the Ariane 6 debut launch. “Arianespace has built its success thanks to the combination between institutional and commercial needs, which has allowed to retain the talent needed for Europe to ensure its independent access to space. We believe it will be no different for Ariane 6,” the executives wrote.